We slipped out in this little weather window today on the Trade In searching for sea bass. We fished in 65 degree green water in 125’ and it was game on. We fished one Wreck for most of the morning. 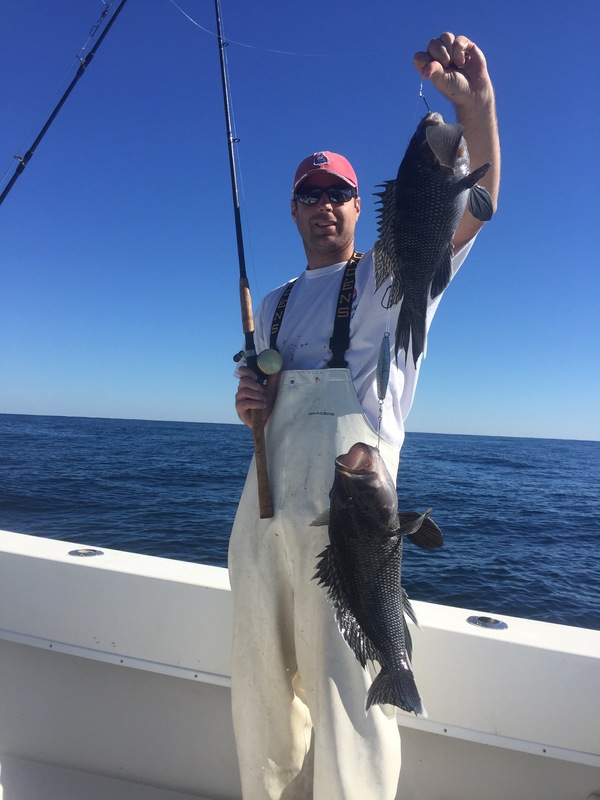 Nonstop action on sea bass with a 4 person limit in the boat in about 3 hours along with a couple trigger fish and bluefish. Throwback to keeper ratio was about 4:1. Beautiful day on the water! I ran the Saltitude again in search of sea bass on some different wrecks and structure heading more to the South out of Cape May. The water temperature was still 68 degrees. We hit a small wreck in 95′ of water and had a pick of keepers here for the first hour but overall it was slow. There were some very small porgies and flounder in the mix as well but we moved on to the Triple Wrecks Area and had plenty of action but all very small sea bass. We moved up into the DE-NJ Reefsite and made a few drifts here where we had action every drift and finally found the bigger fish. With the sea conditions a 3-5 foot chop and wind coming up at a stiff 15 knots we back trolled to stay on the fish and loaded the box with plenty of keeper sea bass. The keeper to throwback ratio was about 3:1 so much better then yesterday and we headed home at noon. Fun fishing. 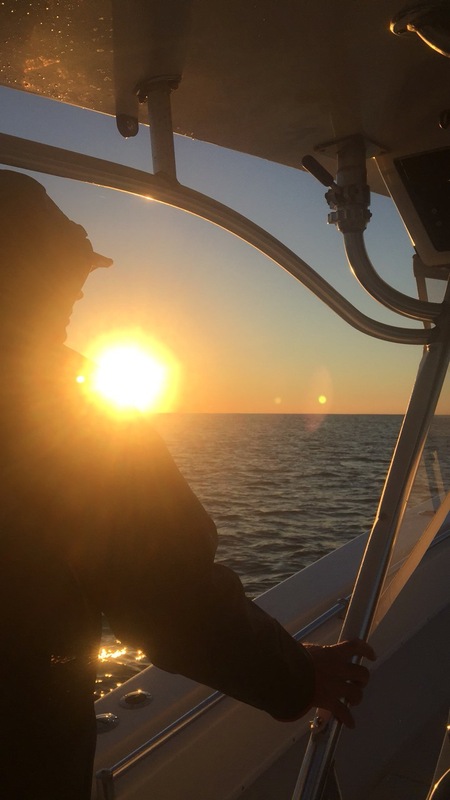 I ran the 52′ Ocean Yacht Saltitude for the opening day of our sea bass season here in NJ. We started off in 100′ of water in the 68 degree water on a wreck first thing in the morning and has plenty of action. We caught about 30 keepers here in the first hour and a half and caught 3 times as many throwbacks. The boats started to pile in and the bite slowed down drastically. 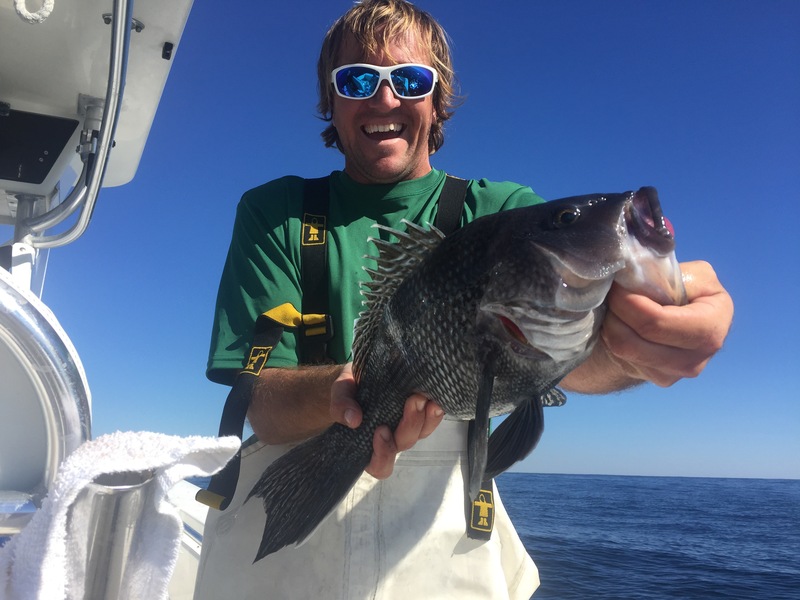 We ran out to another wreck in 120′ and had all you could want as far as small sea bass go and lucked out on a 20″ tog but moved on quickly so we didn’t burn through so much bait on the smaller fish. We ran out past a few other known spots loaded with boats and ended on another wreck in 120′ of water and put 7 more keeper in the box before calling it a day. Clam seemed to work better today then the squid. The sea bass were coming up pretty full spitting up 3-4 whole calico crabs that we turned around and used for bait as well and it was effective for sure. Back at it tomorrow. We rode out on Exile 65 for an overnight trip and made our way to the Carteret in a stiff South wind at 12-16 knots. We tried hitting a few pots upon our arrival for mahi in the 68.5 degree water but no bites so we setup for the nighttime bite. Our first drift was to the NNE at 1.2 knots and at 8:30 we had a nice mako hammer our shallow sword bait and skies out doing flips 3 different times which looked awesome in the starlight. Chuck did a great job keeping the fish tight and after a few awesome runs we were able to bring the estimated 175# mako in the boat. Great start. At the end of this drift we did catch a small swordfish that we released before resetting for another drift. The second drift we came across the canyon again and this time got hooked into a nice sword that Chuck and Zach worked together to bring the fish within range of the gaff. Amazing how powerful hear fish are, it took about 50 minutes until the end game. 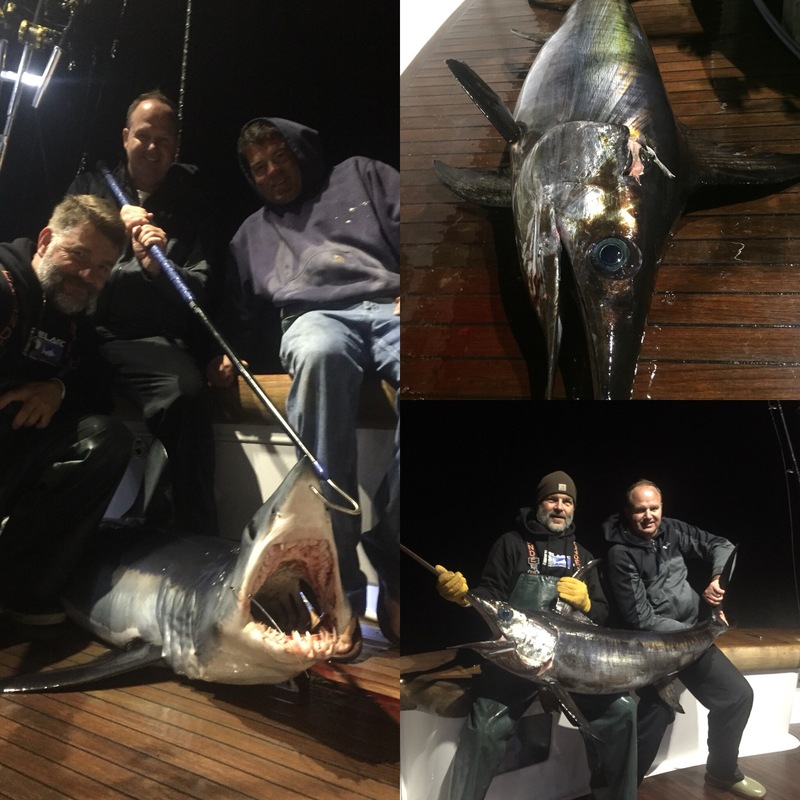 We reset for our third and final drift and had a few mystery bites and then at 5:30 am we had a sword pounding on one of our squids but never fully committed to the bite no matter what we did to try and provoke him. At first light we got up on the troll and pushed off the the warmer 73 degree water in 800 fathoms but overall lifeless. We tried the pots for mahi in the Lindy but the water was green and 65 degrees and we only managed to squeak one out of there before heading home. We made a quick run out to the Lindenkohl Canyon on the 27’ Contender Trade In and went pot hopping for mahi and tilefished all morning. We put some bailer dolphins and grey tilefish in the box and went on a drift in the NE corner of the canyon in hopes of finding a mako but no takers. The water was 68 degrees and blue green. Nothing special to it but meat in the box! I mated for a quick 12 hour trip on Justified. We ran to the Wilmington Canyon and found a 1.5 degree temp break with some scattered weed in the NE corner. Water was blue/green 67.5-69 degrees. 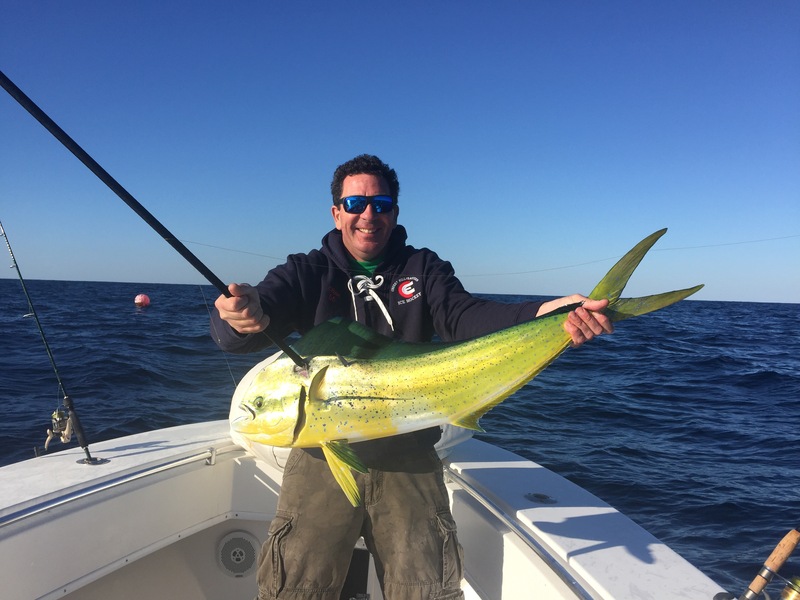 Not much to it other then mahi all over the pot balls which we capitalized on and caught a bunch with spinning tackle to make the day. Looked good, just no bites.